Wanna be the hero to save the world? 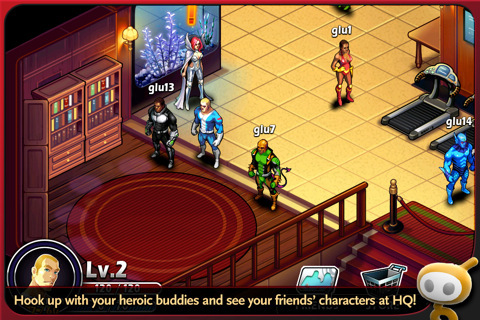 Hero Project is a new interactive freemium RPG game from Glu with loads of lucrative in-app purchases to give your wallet a good workout. If you’re a fan of either Superheroes Alliance or Ultimate Alliance from Marvel, then Hero Project is right up your alley. Download the Hero Project app from your WiFi network and get ready to spend some dough. Make sure you already have iOS 4.1 on your device or upgrade. First step is to get into Game Center. Here Project does not work with iPhone 3G or lower due to lack of Game Center support. The buttons are tiny and you may have trouble tapping them at first. You get to customize your hero right up front. The Hero Project game is made of missions. Accept and complete missions to earn rewards. Some missions require combat in versus mode. You need energy cells to enroll in missions, and you use up and replenish them while in action. You buy energy cells in the store using coins. Coins are used in the store to buy stuff. You get coins form finishing missions or harvesting crystals. When you enroll in a mission, you have to wait… and wait… and wait… on average about 5 minutes before you can continue. You can skip this waiting if you use “Credits”. You get a handful of credits for free when you start the game, and you can buy credits using real money via in-app purchases. The polished graphics with the comic book style RPG scenes are really fun and entertaining. You can hang out with your Game Center friends in the REC-CON. You can really customize your character. The game is slow paced and not in your face, and this can be relaxing, but gets a bit too slow sometimes. Overall, Hero Project is an original RPG game worth checking out. 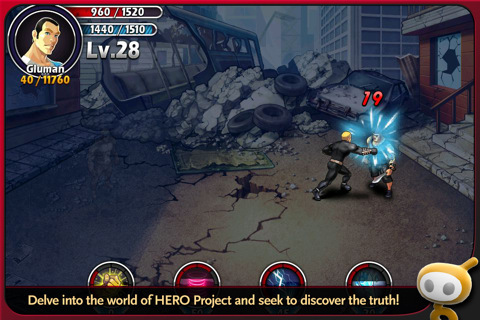 AppSafari review of Hero Project was written by Joe Seifi on December 25th, 2010 and categorized under App Store, Games, RPG. Page viewed 6140 times, 1 so far today. Need help on using these apps? Please read the Help Page. its a nice game. add, Badluckgamer on gamecenter. thanyou. DONT DOwNLOAD this game! It’ll take u hours to realize, IT TAKES MONEY TO Advance!!!!! !